Samsung Electronics launched new induction ranges to take the lead in the fast-growing electric stove market, the firm said Tuesday. While Korean consumers have preferred to use gas ranges, the electricity-powered ranges such as induction burners and radiant burners have been gaining popularity because a growing number of people want to improve the indoor air quality. "Samsung has been enjoying increasing sales of induction ranges mainly due to environmental issues. Due to the worsening air pollution issue, it is getting difficult to open windows at home for indoor ventilation. So many people have decided to change their ranges to induction burners," Yang Hye-soon, vice president of the consumer electronics division of the firm, said during a press conference at the Sampio Cooking Class Space in Seoul. For the 2019 products, Samsung expanded its lineup from four to nine. The products also have a Flex Zone feature that allows users to cook food in up to eight separate cooking zones. Given the induction stoves don't emit flames, Samsung embedded LED lights below the glass of its induction stoves in order to improve safety awareness. Companies in the industry estimate that about 800,000 electronic stoves were sold in 2018 and the figure will surpass 1 million in 2019. Induction ranges with more than three burners have shown an annual growth rate of 25 percent. "The country's induction range market is estimated to become about 1 million in 2019. We hope Samsung will play a leading role in the market," Yang said. Though she didn't provide the exact number, she said Samsung aims to double the sales year-on-year. Samsung said its induction ranges have been recognized in many countries. The firm started to sell its induction stoves in Europe since 2008 and its product received the highest grades from a German product test magazine ETM and Trusted Reviews of the U.K. The firm also took the second-largest share in the United States in 2018 only two years after the firm introduced its induction ranges there. 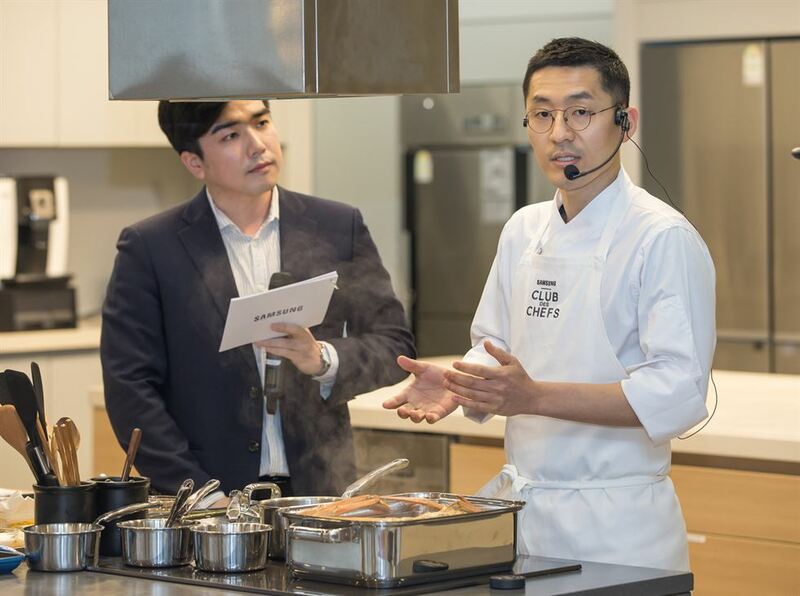 Samsung also held a showcase event with Kang Min-gu, a chef at Korean cuisine restaurant Mingles, in the cooking studio.